Private electricity, gas, water and rail companies pay out £12bn a year to investors and shareholders in interest and dividends. 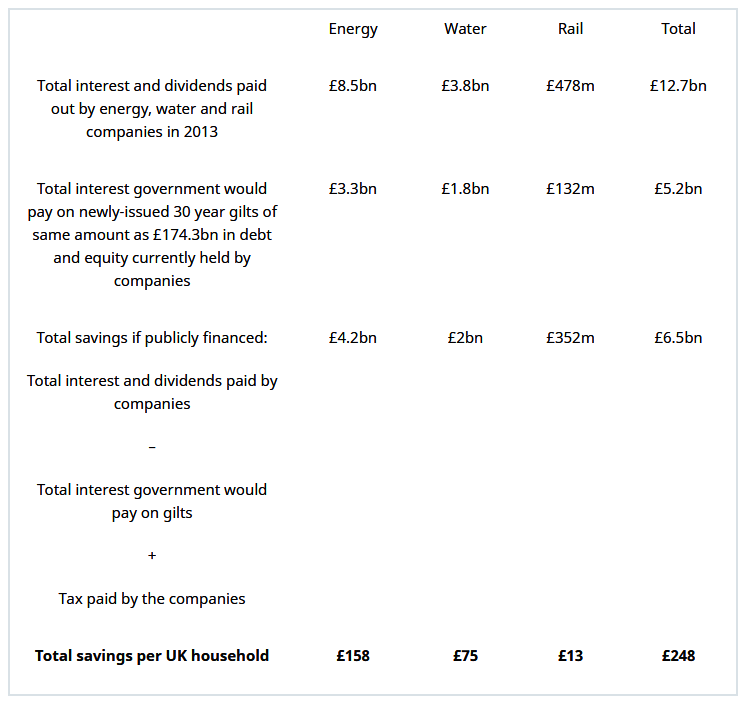 In total, cheaper government borrowing rates could save the UK public £6.5bn: £4.2bn on energy, £2bn on water and £352m on rail. Complaints have never been higher against gas and electricity companies, water companies leak 22% of their water, while the average age of trains is higher than it was before rail services were privatised. Prices and fares continue to rise faster than incomes, making these vital services unaffordable for many. And annual announcements of the pay packets enjoyed by the CEOs of the privatised companies are a regular and reliable source of outrage. As a result of such issues, recent polls have shown the majority of people in the UK support bringing the energy, rail and water services into public ownership. But could it be done? Could the UK afford to run these vital utilities publicly? The government and the companies that currently run these services give two major reasons why privatisation is better: it brings more investment and makes the services more efficient. The argument behind the increased investment claim is that the companies that run privatised services can attract the money of investors from around the world – which they can use to maintain and improve those services. There is no doubt the companies have attracted investors. Banks, investment funds, foreign governments and some of the richest individuals in the world have been more than happy to put their money in the UK’s public services since they were privatised in the 1980s and 90s (see full ownership details in the tables below). When investors put their money into a company, they expect a return. If they have invested in shares in a company, they receive dividends, the amount of which depends on how profitable the company is. If they have lent a company money, they receive interest payments at a specified rate every year. In financial jargon, money invested by shareholders is known as equity, while money that a company has borrowed is called debt. Energy, water and rail companies use this money for the investments they need to make in the services they run. The money for the interest and dividend payouts come from the bills or fares that companies charge their ‘customers’. To satisfy investor expectations, the bills and fares charged by the privatised companies continually outstrip inflation. Between 2007 and 2013, household gas and electricity bills rose in real terms by 41% and 20% respectively. In real terms, water bills have increased by 50% since privatisation, while rail fares are 23% higher than they were in 1995. By analysing the accounts of all of the UK’s private water and rail companies,* the electric and gas transmission and distribution companies and the ‘Big Six’ energy generation and supply companies, Corporate Watch has found that together they paid out more than £12.7bn to shareholders and lenders in dividends and interest in 2013. Similar amounts were paid out in previous years (see tables below for full details). To run these services publicly, the government would need to raise an equivalent amount of money to that currently invested in the companies. ** There are a variety of ways it could do this – raising taxes, cutting public spending in other areas, selling off other public assets, printing money – but most comparable to how the companies are currently financed would be borrowing from international markets. The government would do this by issuing the requisite amount of ‘gilts’ – the name given to bonds, or IOUs, issued by the UK government – to allow it borrow from investors for a specified rate of interest for a certain number of years. UK government debt is popular with investors because it is so secure (as the UK government has never failed to make interest payments or pay off its borrowings). As a result, the government has to pay less interest to the investors that it borrows from than the companies have to pay out in interest to their lenders and dividends to shareholders. No matter how successful a company is, it will always be a riskier investment than the government, and as such will have to pay out more to attract investors. 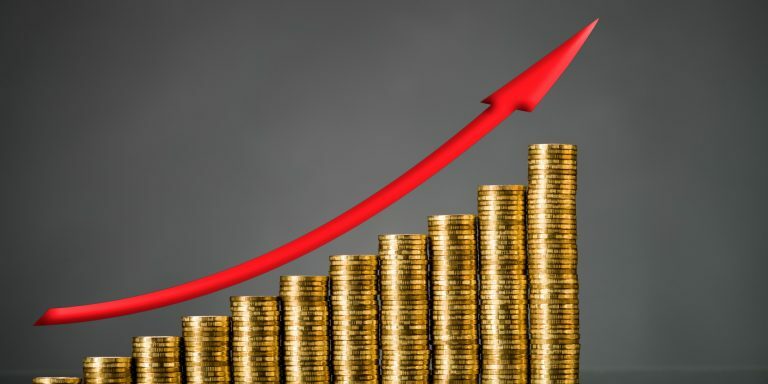 Although the companies like to say only they can attract the required investment, the money raised through issuing gilts would come from many of the same banks, billionaires and investment funds that currently invest in the utility companies, but the government would pay them less in return. If these savings were passed onto households, bills would be hundreds of pounds lower. With current interest rates on long-term gilts, £6.5bn would be saved if the supplies were publicly financed. Divided by the 26.4m households in the UK, this would mean an average saving of £248 per household. But what about the impact on the public sector debt? There’s no doubt that bringing the utility companies into public ownership would add to it. At its present level, bringing £174.3bn of newly-issued debt onto the government books would increase the Public Sector Net Debt (PSND) by around 12%. But power stations, the national grid, water pipes, rail rolling stock and so on are valuable things to own. While it is true that the public sector debt would increase, this would be balanced by an equivalent increase in public sector assets. This is very different from borrowing simply to pay outstanding bills (as the government is currently doing). All else being equal, the newly-public utilities would still be able to cover the cost of the interest payments on the extra debt raised for them, even with the reduction in bills described above. As a result, extra debt taken on to bring the utilities into public ownership should not add to the deficit. Raising the money to pay for the services through government borrowing is not necessarily a perfect solution – public services would still be a source of profit for investors – but it shows there is a financially viable alternative to privatisation. So if the investment argument doesn’t hold, what about the companies’ other big claim: that privatised public services are better because they are run more efficiently? The classic argument for privatisation is that competition between a range of providers for customers forces them all to provide a better – and better value – service. But water supplies, many of the railway routes and the electricity and gas transmission and distribution networks are ‘natural monopolies’: just one company operates these services in a particular region, without competition. Even in the supposedly competitive residential energy market, the ‘Big Six’ companies control 90% of the market and are currently under investigation for price-fixing. There are also a significant amount of extra costs that come with privatisation and competition: the costs rail companies incur bidding for a contract, for example, or the advertising and sales spending by energy companies trying to convince people to switch to them. Since the privatisation of the rail industry, the costs of ‘transaction’ staff – administrators and managers – have risen by 56% as the fragmentation of the industry produced so much duplication of functions in the different companies and new staff needed to deal with all the interactions between them. All this suggests that, if anything, the figures quoted at the top of this report may be on the low side of potential savings from public ownership of the utilities, as they are only concerned with cheaper financing. The Transport for Quality of Life research group estimated privatisation of the railways was costing over £1 billion a year in total, when costs arising from the fragmentation of the service were added to company profits and higher financing costs to keep Network Rail’s debt off the government’s books (a significant increase from the £352m we have estimated here just from public sector financing). In addition to the above, and not considered here, are strong social and political arguments for public ownership, such as greater transparency and accountability, and tariffs that prioritise people’s capacity to pay over shareholder profits. So could the utilities be run better if they went into public ownership now? Evidence from around the world suggests that they could be – if there was the necessary political movement to ensure improved democratic accountability, participation and transparency of the services’ operations. A 2012 academic paper in the International Review of Applied Economics looking at energy (mainly the transmission and distribution rather than generation and supply) in Germany – where more than 200 contracts have been acquired by public operators from private groups – talked of a “pendulum swing” towards public services due to the “greater efficiency of public sector provision, and the greater degree of control over the effective achievement of public policy objectives”. For the railways meanwhile, there is an example closer to home. The East Coast line has been publicly-run since 2009 and can boast a 91% customer satisfaction rate, according to the National Rail Passenger Survey. It requires less public subsidy than nearly all of the privately-run lines and is the most efficient franchise in the UK, according to the Office of Rail Regulation (all of which makes the government’s recent decision to re-privatise the line very difficult to justify). Of course, running these services publicly would not be a simple task. Questions over how to run them are numerous, and political as much as economic: how much control should the central government have over services, for example? How much participation should people have in the running of their local services? Should people pay through bills or general taxation? Should costs be means-tested? And so on. But the economic argument against privatisation is clear: it costs. So why are we still paying for it? Corporate Watch contacted the Department for Energy and Climate Change, the Department for Transport, and the regulators Ofgem, Ofwat and the Office of Rail Regulation for comment on the statistics. A spokesperson for Ofgem said they have referred the market to the Competition Markets Authority for a full investigation as they found that competition is not working as well as it should. The Department for Energy and Climate Change did not respond. The Office for Rail Regulation directed us to the Department for Transport for comment, who also did not respond. The calculations here compare the costs of public and private financing of the utilities as they are currently run. All figures used are based on the value of the companies’ debt and equity as shown in their accounts, as that gives the clearest available idea of the financing needed to run and invest in the services. Note that this is not the same as what investors would be willing to pay to buy the companies. The equity figures used here, for example, are significantly lower than the market value of the shares of the companies – i.e. what their shareholders could sell them for to other investors. Shares in Severn Trent Plc, for example, are currently trading five times higher than the equity value shown in the accounts, a sign of the profits shareholders expects from buying the shares. Acquiring the services from the companies and their shareholders would no doubt give rise to inflated sales demands from the shareholders for closer to this ‘market’ price, as well as threats of legal action and claims for compensation. How best to bring the services back into public ownership is not the focus of this report, but examples from around the world show that these demands can be challenged and negotiated and that the savings made through going public would recoup any compensation or inflated sales prices that did have to be paid. Rail tracks and other infrastructures such as signalling, bridges and tunnels are now owned by the public company Network Rail. Although the amount that needed to be raised would likely be less than the figures quoted here, and as a result, savings would likely be great. See the notes to the energy supply and generation figures for more details. This is the current amount of total debt and equity held by the companies, used as an approximate estimation of the value of gilts the government would need to issue. Under EU accounting rules, however, publicly-owned companies would be treated as part of the trading economy, regardless of ownership, and so would not be included in national debt statistics. And it is worth noting that in the UK, the government does not include the bailed out banks in the most commonly-quoted debt figure it uses. The current of wealth from the world’s abundant natural resources was too often diverted away from populations in need, instead of feeding conflicts and corruption, and leading to human rights abuses and environmental damage, warned a number of high-level speakers as they briefed the Security Council today. Jan Eliasson, Deputy Secretary-General of the United Nations, stated that in too many countries, a wealth of resources, including water, electricity, timber, oil, coal, diamonds and precious metals, failed to translate into equivalent wealth for the people. “Only a powerful few benefit,” he said, adding that the result of that inequality was bitterness, mistrust and alienation ‑ the precursors to conflict. HUMAN SYNTHESIS email: humansynthesis0@gmail.com #PST vil ikke søke etter norske Stasi-agenter Politiets sikkerhetstjeneste (PST) har ikke oversikt over hvor mange informasjonsagenter Stasi hadde i Norge. **DAGS-AVISEN** _av Jan-Morten Bjørnbakk Publisert 2.